Product prices and availability are accurate as of 2019-04-14 18:54:48 EDT and are subject to change. Any price and availability information displayed on http://www.amazon.com/ at the time of purchase will apply to the purchase of this product. Looking for a luscious latte? How about a creamy cappuccino? Want a gourmet coffee experience without spending an arm and a leg? Our electric milk frother quickly creates rich, creamy, and long-lasting froth at the push of a button. Just pour milk up to the appropriate capacity, press start and in just 80 seconds you will have luscious creamy froth. Each unit comes equipped with two small whisks - one for frothing milk and the other for just heating. The default configuration out of the box is heating. 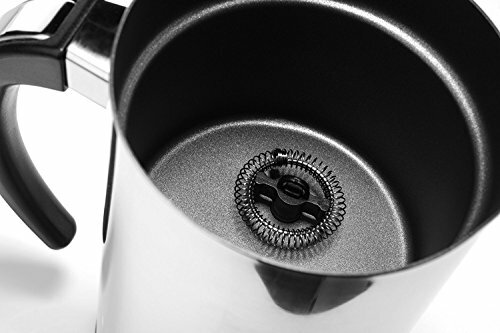 The frothing whisk is stored in the machine, which will froth cold or hot milk. The heavy-duty motor makes thick and creamy froth from whole milk. It will even froth low-fat and non-dairy milks such as almond or soy milk. 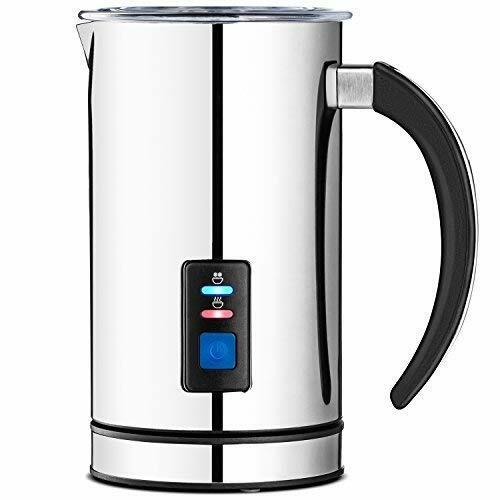 Our milk frother heats about 1 cup (8 oz / 250 ml) of milk at a time. Perfect For Lattes, Cappuccinos, Chai, Hot Chocolate, and much more! We guarantee that you'll be satisfied with our frother's performance, functionality and durability! Now go an enjoy a professional cup of coffee on us! 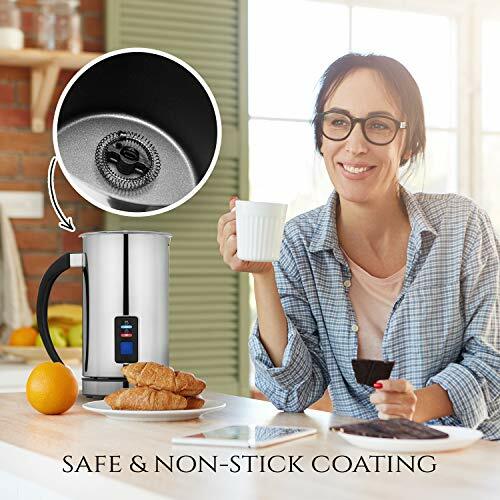 ?Effortlessly create luscious, creamy froth & heat milk at the push of a button | Makes hot or cold milk froth for cappuccino or iced drinks, heats milk for latte and other hot drinks ?Made of high quality stainless steel housing and carafe conveniently detaches from base for easy pouring | Vacuum insulation helps contents maintain temperature ?NEW FROTH DENSITY FUNCTION: Choose from Hot Airy Foam, Hot Dense Foam, Hot Milk, or Cold Milk Frothing ?Capacity: Frothing 4.25 oz / 125 ml | Heating 8.5 oz / 250 ml ? 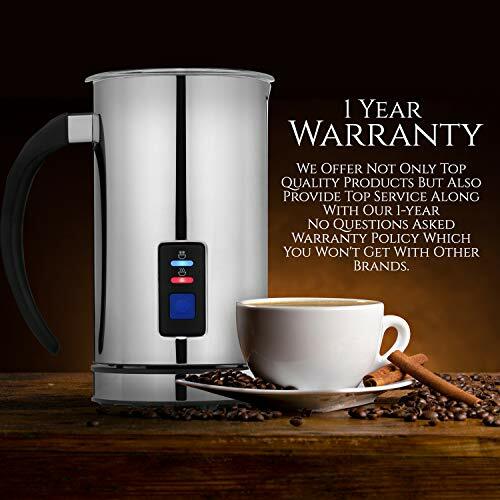 ?LIMITED 2 YEAR WARRANTY: Guaranteed to give you the best froth, no matter what!? ?